MPPT or maximum power point tracking charge controllers are a relatively new product in the solar electricity game. They have a few distinct advantages over the older styles of charge controllers. This is the original purpose to create the MPPT charge controller. All solar modules have a maximum power point voltage or SWEET SPOT. The SWEET SPOT is the voltage at which a solar module will make the most energy. An MPPT controller will connect to the solar module at the best voltage and then reduce the voltage to charge the battery. By connecting to the module at the mppt voltage, the output will be better by up to 30 percent. Before MPPT, customers would have to choose a charge controller and solar modules according to the voltage of the battery. If you had a 48 volt battery bank, you had to use a 48 volt solar module and a 48 volt charge controller. If you decided to decrease the battery bank voltage, you had to swap your solar module and your charge controller. Not anymore. MPPT charge controllers can take a higher voltage from the solar module and reduce it to charge the battery. As long as the solar module produces more voltage than the battery bank, the battery will be charged properly. If you decide to change the battery voltage later, the charge controller can be adjusted to the new voltage. 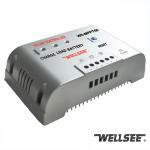 Another great feature of a lot of MPPT charge controllers is that they can accept voltages up to 250 volts. There is even at least one MPPT charge controller that can accept up to 600 volts DC and reduce it to charge a battery bank. Think about this. You have a long transmission distance between your solar array and your charge controller/battery bank. In the past you would have to transmit that electricity at 12, 24 or 48 volts. In a large array such as 10,000 watts, that would equate to 833 amps at 12 volts DC or 416 amps at 24 volts or 208 amps at 48 volts. Up the voltage to 600 and the amperage is only 16 amps. That equates to decreased size wiring and a lot less loss to resistance in the wire. Are MPPT charge controllers worth the extra cash? I would have to say YES in most cases. Solar modules must make high enough volts to charge a given battery. For example: A 12 volt battery bank requires at least 15 or 16 volts from a solar panel in order to charge. If the solar panel's voltage is lower than the battery, the battery will not charge. Even with MPPT, a solar panel's voltage must be higher to charge the battery. There is one new product being designed right now that will actually boost the voltage making it possible to charge a 24 volt battery with a 12 volt module. When the level of voltage in a battery passes a certain threshold, the charge controller will halt the charging process. In older charge controllers, this was accomplished through the use of a mechanical relay. 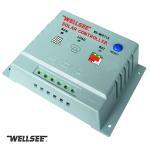 More recent charge controllers make use of pulse width modulation (PWM). This is a process in which, as the battery starts to reach a fully charged state, the amount of power being transferred to it gradually decreases. In addition to reducing the stress on the batteries that results from the charging process, PWM keeps them more fully charged, making them more efficient from the user’s perspective. PWM charge controllers can also be used to keep batteries in a fully charged state indefinitely. PWM chargers are more complicated, but they tend to be more durable, as they don’t have any breakable mechanical connections. The most recent types of solar charge controllers use maximum power point tracking, or MPPT. MPPT controllers offer the ability to convert excess voltage into amperage. This feature has a couple of major benefits. The majority of solar power systems make use of 12 volt batteries, not unlike the ones used in cars, but these benefits hold regardless of voltage. Charging the batteries usually takes less voltage than what the majority of solar panels actually produce. By turning the excess voltage into amps, MPPT charge controllers reduce the time necessary to fully charge the batteries, while keeping the voltage at an optimal level. This way, the solar power system as a whole operates at the highest possible level of efficiency. MPPT charge controllers also make a difference in terms of power loss. As low-voltage electricity travels along wires, it can experience high levels of loss, reducing the efficiency of the system. A PWM charge controller used in a system with 12v batteries, for example, would use electricity of around 18v. An MPPT controller will use the highest voltage of any type of charge controller currently available. Systems using MPPT controllers are more efficient for this reason as well. MPPT charge controllers are usually more expensive than older ones, but the advantage is substantial. It’s highly recommended that, if you can afford it, you choose an MPPT charge controller. Finally, it can also be possible to prevent reverse-current flow with some modern charge controllers. In some cases, at night, the batteries may begin to send power back to the solar panels. This type of power loss can also make a serious dent in the overall efficiency of a solar power system. When the solar panels stop providing electricity, the charge controller opens the circuit, preventing any reverse-current flow.